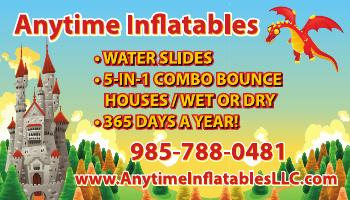 At Anytime Inflatable we strive to give quality rental time!!! One day rental will equal up to 24hrs. Weekend rental will equal up to 48 hrs. Unless other arrangements are made at time of booking. Deposit of $50 will be required at time of booking – this will go toward your rental cost. Cash or Credit Cards excepted. Serving areas: Mississippi Gulf Coast – MS – Biloxi – Gautier – Gulfport – St. Martin – D’iberville – Woolmarket – Vancleave – Ocean Springs – Moss Point and surrounding areas. 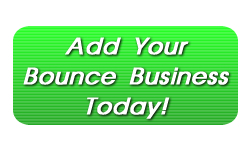 Biloxi Bouncehouse LLC serves the Mississippi Gulf Coast region with great inflatable rentals and more! We offer clean and sanitized commercial grade inflatable bounce houses, moonwalks, obstacle courses, pucker powder, waterslides, and more. Contact Us for pricing or visit our website for more information on how we can help make your next birthday party or other event a great success.